Two physicians unveil a revolutionary, accessible, science-based, patient-centered program for living an active, age-defying, disease-free life. Healthcare is pulled and shaped by many forces, by drug and insurance companies looking for profits, by politicians in search of votes, and by stressed, overworked physicians who barely have time to talk to you before writing a prescription or packing you off to a specialist. So is anyone interested in keeping you well? Yes. The Ultraprevention program will work for everyone. The promise of its practice is huge -- a health span that matches life span -- and you'll experience increased energy, weight loss, enhanced mood and memory, better digestion, deeper sleep, diminished stress, and more. Isolating the source of more than 90 percent of today's most common diseases, from cancer and heart disease to diabetes, stroke, and Alzheimer's, Drs. Hyman and Liponis enumerate the Five Forces of Illness -- Sludge (malnutrition), Burnout (impaired metabolism), Heat (inflammation), Waste (impaired detoxification), and Rust (oxidative stress). 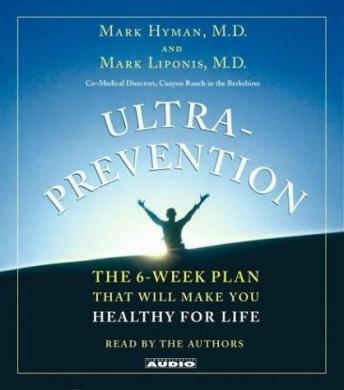 Through the practice of the six-week Ultraprevention program, you'll learn three simple steps that stop these forces and create a lifetime of good health. So stop falling for the myths that make you sick and start Ultraprevention, the powerful plan to get older without aging, to maintain health for all of life.